No Rough-In’s..No Pre-Alignment..No Wasted Time.. 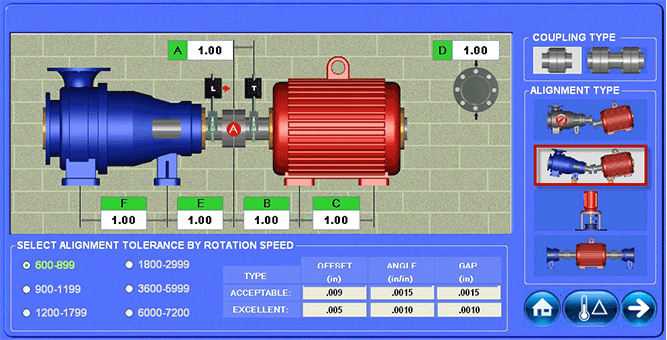 Most laser alignment systems require a rough-in or pre-alignment of the machine before using the system. This means you’re doing the job twice and that doesn’t seem very “easy” to us. Why pay for technology that doesn’t make your job easier or get it done faster? Don’t take our word for it, take a look at the Swedish company Damalini’s Easy-Laser® E710 (their top-of-the-line system) manual, where we’ve taken the liberty of highlighting where they talk about rough alignment. 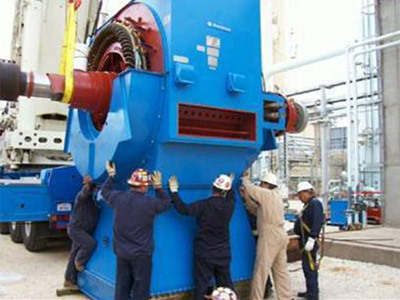 We are not surprised because their “over-under” technology is very sensitive to angular misalignment and requires a rough alignment to ensure you can take a full set of rotation data. Here is another example from Fixturlaser. In this 230 page manual they have 5 pages dedicated solely to pre-alignment/rough-in. Again this is due to the “over-under” technology they use and its inherent inability to cope with even very little angular misalignment. 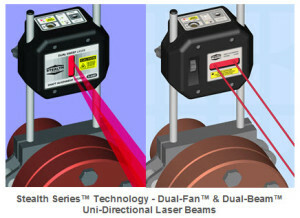 We don’t think you should waste time on rough alignment either and that’s why our engineers designed the Stealth Series™ laser shaft alignment systems with Dual-Beam™ and Dual-Fan™ technology, featuring extra-large PSD measuring areas (up to 33×13 mm), not only for a precise alignment, but also so you don’t need to use any other alignment tools to do motor alignments. Larger PSD’s mean the laser beam is much more likely to hit the sensor, even during new-motor installations or on long-distance applications. The longer the laser beam stays on the target during data taking, the more likely you will get enough data to generate results and not have to do a pre-alignment. Oh and for the record, we think 40 degrees of shaft rotation just isn’t enough to get the job done right, despite what the others say! We allow it because you asked for it, but don’t recommend it! One of the great advantages of the Stealth Technology is our Uni-Directional laser beams. This means the laser only shoots in one direction and is only placed on the stationary unit. Why does this matter? Well if you have ever used one of our competitor’s “over-under” lasers (2 lasers, shooting in 2 directions), you have probably been really annoyed that as you rotate the shafts, the lasers quickly rotate off the PSD. This is because by having the laser on the moveable unit, it doesn’t take much of an angular misalignment for the laser beam to rotate off the targets, especially application distances over 2 feet (610 mm). So this means you are required to do a rough (pre) alignment of the movable asset to get the right angle so the darn laser beams will stay on the target and you can get the results. Kind of annoying, don’t you think? 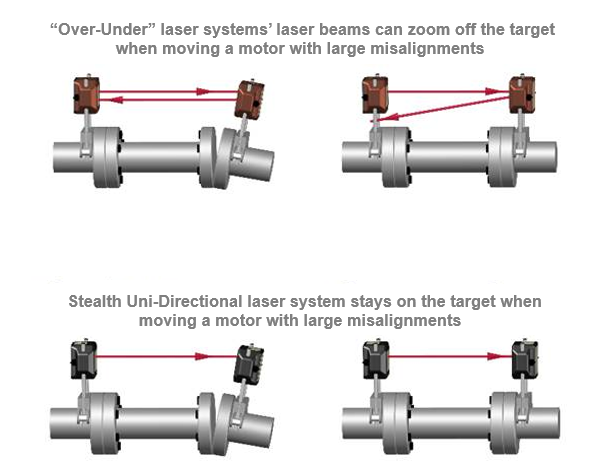 Over-Under lasers are even worse when you are on the move screen and start making your moves because the minute you start moving the motor in angle, the laser beam on the motor very quickly zooms off the target on the stationary unit. This requires you to re-take the data and start over again! What a pain! Compare that with the Stealth Series uni-directional laser technology, again with the laser only on the stationary site. This means when you go to make your move, your laser stays on the target! Now on long-distance applications, you can insert your shims, make your moves, and retake your data all at once! For new motor installations, our Stealth Series’ impressive +/- 5 degrees (+/- .085″/in. or 8. 5 mm/100 mm) of angular range, means you can drop the motor down, slap on the motor installation-2brackets and start taking data without having to take out the straight edge to pre-align the motor just so the beams will stay in the tiny window during shaft rotation. We even pre-aligned the laser and target to the brackets, so even if you have a truly massive, starting, angular misalignment, then you can use the laser to do “rough alignment”! So put down the straight edge and chuck the “over-under” lasers in the garbage, and learn about how Hamar’s Stealth Series™ laser systems will make your life so much easier than it is now! We have a system that’s perfectly aligned with your needs, and your budget. Normally, we’d offer you a trade-in for your straight edges but we don’t want them either! For the “over-under” laser trade-ins, we love getting ineffective instruments off the market so we can have some fun so make us an offer! Stealth Series™ Align with the Best!